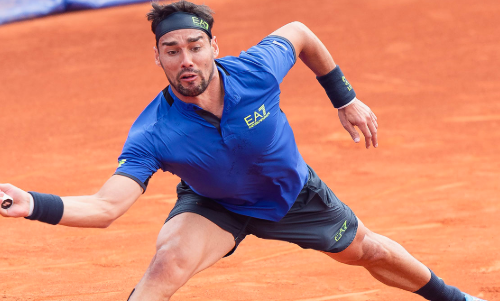 Italian tennis player Fabio Fognini had a tough day in the office on Tuesday as he crashed out out of the ATP 250 Grand Prix Hassan II in Marrakech. He lost 6-7 4-6 to Jiri Vesely of Czech Republic in the first round. No wonder, it was his racket that had to bear the brunt of it… not once, but twice during the one-hour and 46-minute encounter. After being broken at 1-1 in the second set, Fognini vented his frustration on the poor racket, banging it with all his might. He picked it up again, only to smash it once more, making it shapeless and useless. The second one was more ferocious. Fogninii banged his new racket so hard that its head came off immediately, flung in the air, almost hitting him on the face. Phew, that would have hurt him badly had it connected. No wonder, Fognini looked out of sorts during the defeat as he committed a couple of double faults, won just 41 per cent of the points on first serve, and was broken twice en route. As for Vesely, he advances to second round to face Juan Ignacio Londero of Argentina.